The F-16 is an aircraft that really needs no introduction. It’s an aircraft that has become world famous since the 1980’s. With production being undertaken in Europe by a number of countries for use in their own air arms. One famous user is Belgium, who have prominently displayed their F-16’s over the years as a solo display at airshows across Europe. Their aircraft, like a number in the European air arms inventory has undergone an MLU (mid-life upgrade). 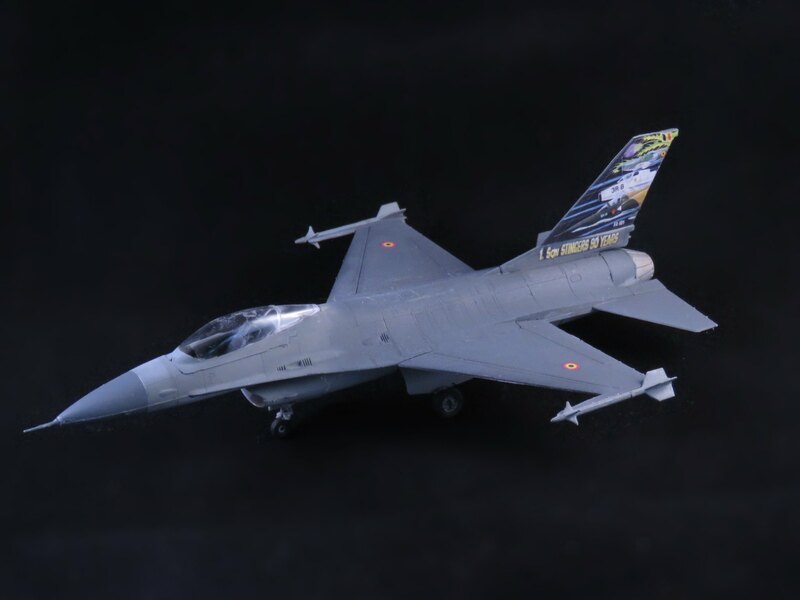 The aircraft depicted by Airfix’s kit is a the F-16A/B, which Belgium originally had. The kit is pretty old, meaning it won’t have some of the intricacies of the newer kits from Revell (which dates from 2000, where as this kit dates from the early 1980s). This article will be relative short in comparison to others, as I actually built the kit a while ago, but forgot to even mention it on here…I don’t normally do reviews this retrospectively, but I see this kit out there a lot on second hand model stalls at shows, so wanted to share my experience. The boxing I got came from later, however, it is the same kit. Surprisingly I found the kit held together pretty well. It was nice inside, and didn’t feel as dated as some of the other Airfix kits (the Seahawk being a good example). Construction is relatively simple, though it did bare some frustrations – mostly brought about by my newer experiences with Trumpter kits. The tail section wasn’t the most stable in my opinion. I found it quite hard to get it at the perfect angle, as the physical guiding on the kit was rather small/unstable. The wing construction and remaining fuselage complainants are really easy to assemble without issues. I did mine without weapons, so I can’t really comment on how well these may have gone together. Next to a Mig 29 that sadly never got finished. 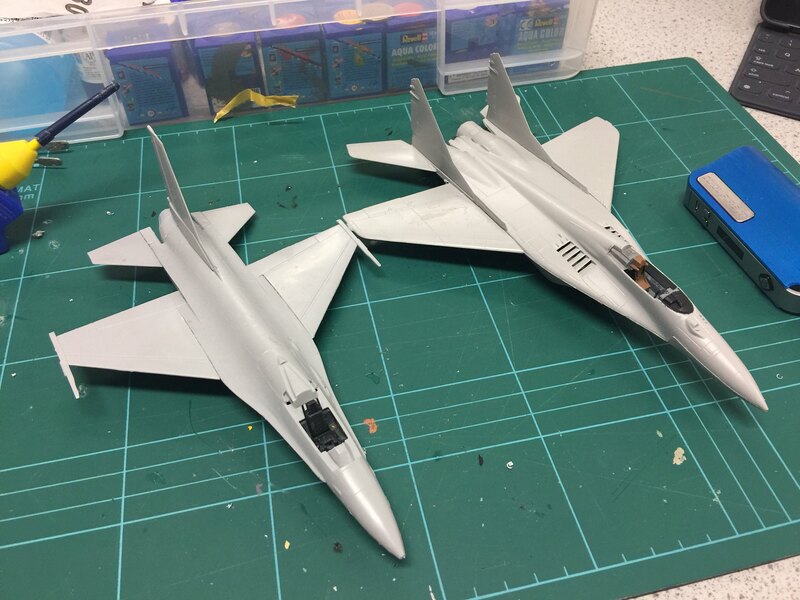 However, compared to some other kits that I had attempted to build at the same time (I was working on a Taiwanese F-16 kit for example), it held up really well. In fact, once finished I was really impressed with what the kit had managed to accomplish. Bar the ridiculously basic cockpit, the overall finish was quite good. Panel lines are raised, which is to be expected from a kit this old – but not so large that it is off putting. I did not use the decals from my kit though. I had an Italeri kit (as yet unfinished) that had the decals for a 100th Sqd anniversary. I found this much more appealing than the plain tail that came with the Airfix kit, so popped it straight on (besides, I was going to use the Italian decals on the Italeri kit). The decals that came with it were sufficient though, just not to my tastes. As you can tell from the above picture, there are a few gaps on my model. I assembled mine relatively quickly for a show, and thus didn’t take the due care to fill any gaps. In person there not anywhere near as prominent – but they’re also easily fixable. The canopy however, fit really well. Considering it’s age I am very surprised how well it fit in place. The landing gear and undercarriage sections are very basic, but their shape is passable. For an average modeller like me, they’re perfectly acceptable. For a more experienced modeller (or rivet counter) I’m sure that you’ll want to replace these with more accurate or comprehensive versions. Alternatively, sacrifice these to a willing donor (like a KAI T-50 from Accademy) and build it gear up, if you have a stand. I only built this kit to learn to airbrush. 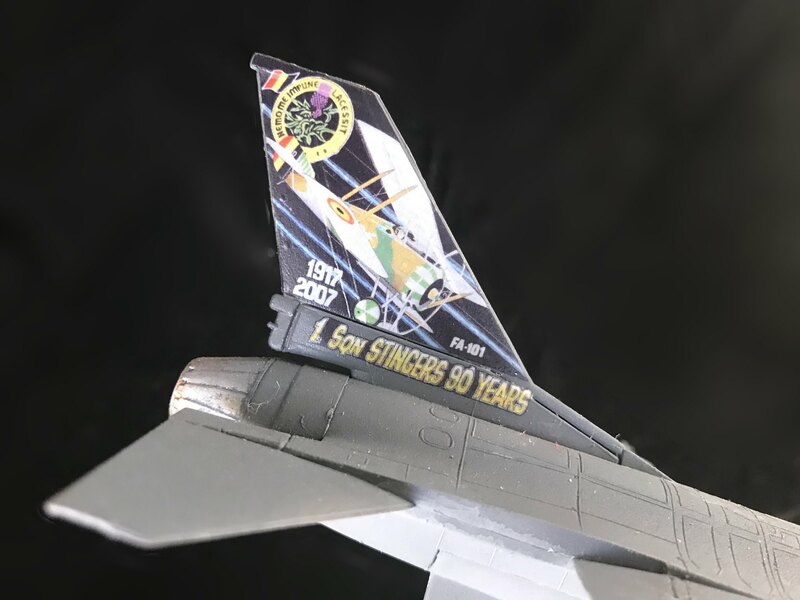 I hadn’t used an airbrush for any sort of soft edges before and the F-16’s 3 grey tones were an easy trial for me. The Airfix kit can be found at model shows and floating on the second hand market for anywhere between €5 to €10. At this price, it’s an easy sell – if you just want a relatively okay F-16 to build, and can’t find the Revell version. Probably not. Confused? It’s not because it’s an awful kit. It isn’t. It’s because the Revell kit barely costs more these days (especially at model shows) and has made this kit almost entirely redundant as a result. I did it because it came free with another kit I bought, and I’m glad I did. I wouldn’t say it’s a bad buy..but now I have the Revell version I’d much rather that.